You see a tiara on a model and fall in love with it. It may look perfect, but be aware your headpiece may not look the same on you as it does on the model. It can enhance your natural beauty or merely appear ho-hum. When we think “tiara,” most of us picture the princess type–peaked in the center like royalty. There are other shapes as well, however. Those shaped like a headband or symmetrical arch, for example. In fact, these days there is more selection than ever–flowers, feathers, and hats as well as the traditional tiara–that make it easier to express your personality in a beautiful way. There are also more subtle accent pieces that can enhance your look in a more subtle way. Pins, twists, or other “hair jewelry” can combine to take your hair style to the next level. The bride in the photo, for example, has added contrasting beaded hair ornaments the same size as the crystals in her tiara. Along with the subtle and creative hair styling, she’s created a look that both reflects her personality and highlights her beauty. The general rule of thumb is your headpiece should balance out the shape of your face. If you have a full or round face, for example, consider princess tiaras with peaks at the top to elongate your face. Conversely, a long face requires a flatter (and perhaps wider) piece, such as a headband. Heavy beading or other adornments can help balance a long, thin face. Oval faces are pleasingly symmetrical and tend to look well with most headpieces. If your gown has elaborate, embroidered patterns, look for a tiara with similar detailing. A gown with clean lines calls for something more streamlined. Wear pearls in your hair with an ivory or cream colored gown, or match them to those in your earrings or necklace. 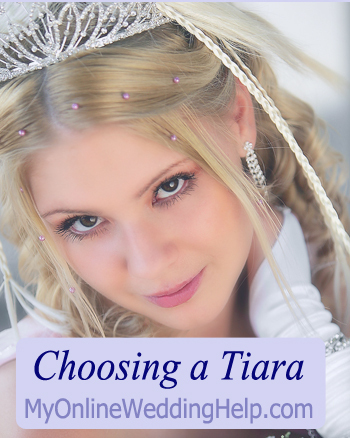 Crystal or rhinestone tiaras without ornamental details will go with any dress. A vintage tiara may set off your traditional gown, while a more modern design looks better with contemporary fashions. Remember that you are striving for an overall balanced look, one that conveys an impression of both your personality and the importance of the event. While the details can (and should) reflect who you are, no single aspect of your wedding ensemble should take precedence. Rather, the design of your headpiece and veil should complete the look, transforming your eye-catching gown into a truly spectacular vision.